PHILADELPHIA — As a hotbed for sustaining growth within Digital Health, few global markets are so positioned to thrive as the Greater Philadelphia region. 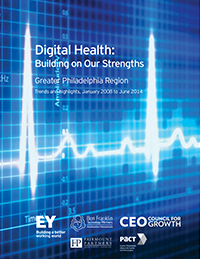 In a joint study by Ben Franklin Technology Partners of Southeastern PA, CEO Council for Growth, Ernst & Young LLP, Fairmount Partners, and the Greater Philadelphia Alliance for Capital and Technologies (PACT), the Greater Philadelphia region’s strength and potential in Digital Health is explored, with more than $900 million in investment/exit activity in the region’s Digital Health sector since 2008. Of the 100+ digital health companies in the region, more than half are focused on improving the effectiveness and efficiency of health care providers, including hospitals, physicians and other caregivers. With 198 hospitals and headquarters of two of the nation’s largest health insurers – (Cigna, Independence Blue Cross) – nearly two-thirds of digital health companies in the region are developing provider/payer solutions. Philadelphia is within two hours of 80% of the world’s major pharmaceutical companies, and home to GSK’s US headquarters. The pharma-focused subsector of digital health accounted for 21% of the region’s digital health companies, attracting the most outside investment during the period studied. As patient-focused healthcare management gains traction, patient engagement applications accounted for the region’s largest portion of consumer-focused digital health companies. To accelerate the growth of digital health in response to the Affordable Care Act, key stakeholders have organized around a common vision to leverage the region’s assets to increase recognition as a global leader in health care innovation. “The evolution and convergence of the health and technology sectors continues. Match that with both the opportunity and spirit of the region, and there’s clearly a bright future for Digital Health here,” says RoseAnn B. Rosenthal, President and CEO of Ben Franklin. “We continue to be impressed by the consistency of activity in the greater Philadelphia region, which has increased over the past 12 months,” said Amy Dorfmeister, Ernst & Young Strategic Growth Markets (SGM) Partner. “The healthcare IT sector continues to be very strong and should continue to see increased activity throughout 2014,” she added. “Greater Philadelphia possesses world-class health care assets that will accelerate and lead the development of innovation in health care technology and delivery. The CEO Council for Growth supports key regional partnerships that will leverage these health care assets and is pleased to collaborate on this important report. Recognizing the growth potential of the digital health sector, the CEO Council for Growth has begun to convene regional leaders to develop a “laboratory” for health care innovation, and is utilizing the marketing and promotional strengths of Select Greater Philadelphia to highlight innovations within the regional health care sector,” said Rob Wonderling, president and CEO of the Greater Philadelphia Chamber of Commerce and Chairman of the CEO Council for Growth. The full report is being released today at the 2014 IMPACT Capital Conference (www.phillyimpact.com). Ben Franklin is the most active early stage capital provider for the region’s technology sectors. Ben Franklin combines best practices of venture capital with a public-spirited purpose: leading the region’s technology community to new heights, creating jobs and changing lives for the better. Ben Franklin is an initiative of the Pennsylvania Department of Community and Economic Development and is funded by the Ben Franklin Technology Development Authority. The CEO Council for Growth (CEO Council) is a devoted group of more than 55 business, higher education, and civic leaders who commit their time and efforts to enhancing economic growth and prosperity in the 11-county region across northern Delaware, southern New Jersey and southeastern Pennsylvania. The CEO Council is an initiative of the Greater Philadelphia Chamber of Commerce influencing regional and national policy through advocacy. EY refers to the global organization of member firms of Ernst & Young Global Limited. It is a global leader in assurance, tax, transaction and advisory services. Worldwide, its 190,000 people are united by its shared values and an unwavering commitment to quality. EY makes a difference by helping its people, its clients and its wider communities achieve their potential. Ernst & Young LLP is an EY member firm serving clients in the US. Fairmount Partners provides merger and acquisition, capital raising and strategic advisory services to fuel growth and maximize value for middle market companies. We work closely with healthcare and technology industry executives (and their investors) to complete sales, acquisitions, and financing transactions. We also work closely with private equity firms to execute growth and acquisition transactions to facilitate effective exits for their portfolio companies. From 2011 through 2013, the total value of our completed transactions exceeded $2.0 billion. Greater Philadelphia Alliance for Capital and Technologies (PACT)’s vision is to be a premier resource for emerging growth companies in the technology and healthcare industries. We connect emerging growth companies, investors, professional advisors, universities and technology-focused corporations to network, develop relationships, pursue business opportunities, and market and promote their businesses to foster growth and innovation.